https://sep.yimg.com/ay/yhst-33477391359232/cubicus-boxfish-ostracion-cubicus-box-fish-5.jpgCubicus Boxfish - Ostracion cubicus - Box Fish Expert Only!!! Not Cover Under Arrive GuaranteedSemi-aggressive180 Gallon17.7 inchesYes, with CautionOmnivore, BrineIndo-PacificOstraciidaeSmall 1" - 2"
Having an odd carton-like shape, the cubicus boxfish is enclosed inside rigid fused scales that act like a coat of armor. This shell only has openings for the mouth, eyes, gills, and tail. The bright colors and spots of this boxfish are warning coloration or colors and patterns that alert other animals it is poisonous. As the cubicus boxfish grows to its maximum length of 18 inches (45 cm) it takes on a blue metallic coloring. The Cubicus fish is popular with most Aquarists, however this fish has been implicated directly in tank wipeouts from its passing on in the aquarium. It is however, relatively hardy and will adapt quite well to the community aquarium quite nicely. Should one of these fish pass on in the aquarium, remove the specimen immediately. It is then highly recommended to do a 50% water change, and introduce a bag of activated carbon into the filtration, to help absorb any possible contamination. The Cubicus should not be kept with aggressive or fast moving fishes and their skin can be damaged by the actions of cleaner fish. Cubicus should not be kept with other Cubicus or other Boxfish, as they can be territorial. Maximum Size: The Ostracion cubicus grows up to 18 inches. General Size Specifications: The small size will come to you generally 1 to 2 inches; the medium generally 2 to 3 inches; the large generally 3 to 5 inches. Minimum Tank Size: The Cubicus Boxfish prefers a tank of at least 150 gallons with plenty of places to hide & swim. TankConditions: Keep water quality high (SG 1.020 - 1.025, pH 8.1 - 8.4, Temp. 72 - 78� F). Range: Indo-Pacific, Red Sea and East Afica to the Hawaiian and Tuamotu islands. Habitat: Camel Cowfish occurs near Sri Lanka, Indo-West Pacific, Red Sea, and East Africa eastward through Indonesia to northern Australia, northward to southern Japan. Immigrated into the southeastern Mediterranean through the Suez Canal..
Natural Environment: Camel Cowfish are found throughout the world, and are most commonly associated with coral reefs. They can also be found near rocky areas, sand flats or grass beds. Feeding and Diet: Picking tiny animals like worms, clams, crabs, shrimp and fish or algae from the sand, the cubicus boxfish uses its thick puckered lips to blow jets of water at the sand, exposing any hiding animals. 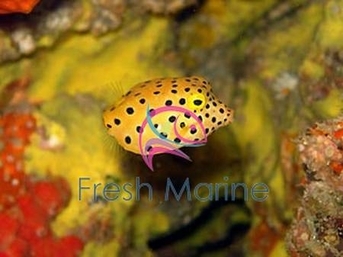 Reproduction Male cubicus boxfish breed with a harem or a small group of females. The male is territorial, which means it protects a certain area and the females there too. A male has a number of mates, and spawns with all of them each evening when the waters are warming in the spring. After the male has raced around a female for a few moments flashing bright colors, the pair swim up close to the surface, then the male hums to the female, with a hum loud enough to be heard by a diver. After a short nuptial song the cowfish spawn. Boxfish mate in the spring when the ocean waters warm up. At sunrise or sunset, the male flashes bright colors, trying to attract a female. The pair of boxfish rush to the surface, getting away from the reef to pelagic spawn, which means they mate in an area that the fertilized eggs will be taken away on the currents to drift into the open ocean. After the fertilized eggs are released, the boxfish dash down to the reef to hide. By doing this so quickly, many egg eating predators may not see them release the eggs and they float away safely to other reefs. The eggs hatch and the larvae remain in the epipelagic zone or the zone in the open ocean near the surface. When the small fish grow large enough to fend for themselves, they swim down to join the other creatures on the reef. Threats and Management Boxfish secrete poison from their skin when they are in danger or stressed. Many reef predators will take one taste and spit them out. This makes it difficult to keep boxfish in a home aquarium. They may end up poisoning other fish and even themselves. These fish are sometimes dried out and sold to souvenir shops, where the boxfish fish are lacquered. Otherwise, they are not highly sought after because their organs are poisonous. The poison in the fish actually comes from a type of toxic algae that the boxfish eats. Skilled Japanese chefs prepare boxfish and porcupinefish, which is called fuga, in a way that retrieves the meat and almost all the poisonous parts are cut out. A slight amount of poisonous meat is left to be served with the safe portion. The diner feels somewhat woozy after eating the fuga. Prepared in this way, these fish are considered a delicacy. On occasion, a person eating the fuga dies. While boxfish are taken for souvenirs and occasionally to eat, there hasn't been an overabundance of them taken from the oceans. Their population remains stable. Did You Know? The boxfish may get excited in the home aquarium and actually leap out of the water if the top isn't on the tank.